D has not stopped smiling today, it’s been lovely. She’s been smiling so much she’s been on the verge of a squeal at times. Why? Because it’s Hubbie’s and my wedding anniversary today, 14 years married and also 16 years today since we had our first date. Loom bands! 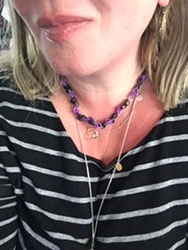 D made me a purple and black necklace and Hubbie a blue and white (football colours) bracelet. She also did some fantastic writing in a card. The loom bands were lovely to receive and she’s mega pleased that we’re still wearing them. The best present has been seeing our children smiling, can’t beat that.